Mike has adorned his body with a plethora of tattoos that have gradually accumulated over the years. Many are influenced by his life, side bands, and loved ones. "I usually get mine done by the same people, except this one chick who tried to tear my skin off. 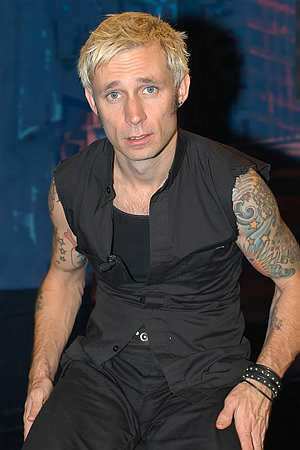 "- Mike Dirnt on getting his tattoos. 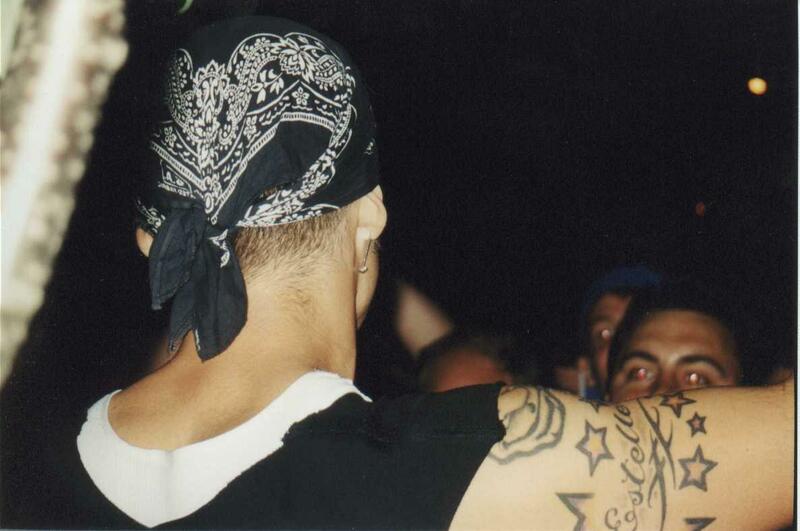 By far the largest tattoo on Mike's right arm, though barely visible, The Frustrators skull and crossed bones symbol represent one of his side bands. 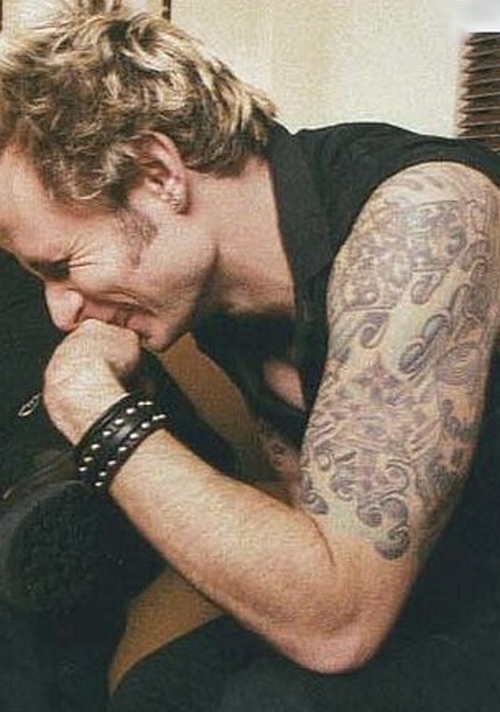 To the left is a rather feminine tattoo, dedicated to his only daughter Estelle. It includes her name in a fancy script encircled with red and yellow stars, making reference to her nickname Stella, meaning star. Above that you will find the face from the 1,039 Smoothed Out Slappy Hours booklet. In the CD the caption below the face is labeled "Mike". On the back of his biceps you will find a tattoo of a 45-RPM adaptor, which are used to play vinyls. Wrapping around the top of the adaptor are the letters EBPM with a happy face on the left and a sad one on the right. The letters EBPM stand for the East Bay Punk Mafia, a "mafia" created as a joke between the band members.However, it is also rumored that EBPM stands for East Bay Pop Mafia, and is a twist on the Twin City Pop Mafia which was formed by the band Dillenger Four. 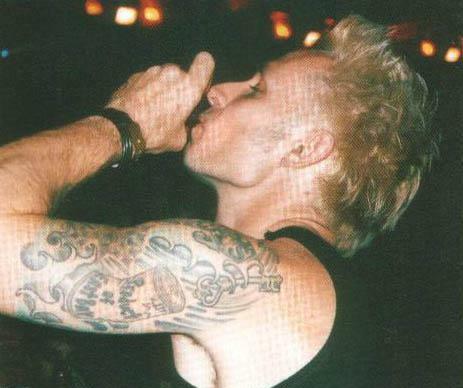 Tré and Billie Joe have similar tattoos. You will also find the word "Brittany" on the inside of his arm, dedicated to his girlfriend of the same name. 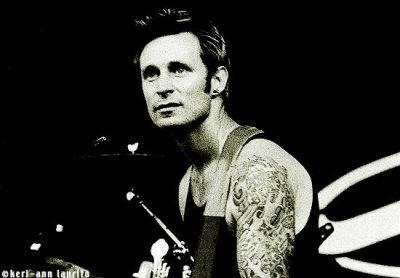 The only tattoo found on the front of Mike's forearm is the Japanese symbol for pot, reminiscent of their teenage years. 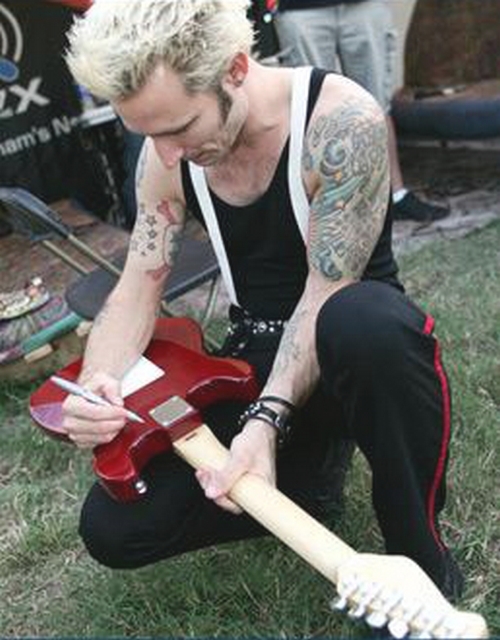 To balance out the large number of tattoos on his right arm, Mike has a large tattoo, which takes up half of his left. This tattoo like the EBPM one also has East Bay references. A large dented can with the words "Product of East Bay", taking the main center of focus, is surrounded by swirling water. In the water you can also find building blocks, a cross with a pyramid that has an eye in the middle, and a key with a heart on the end. 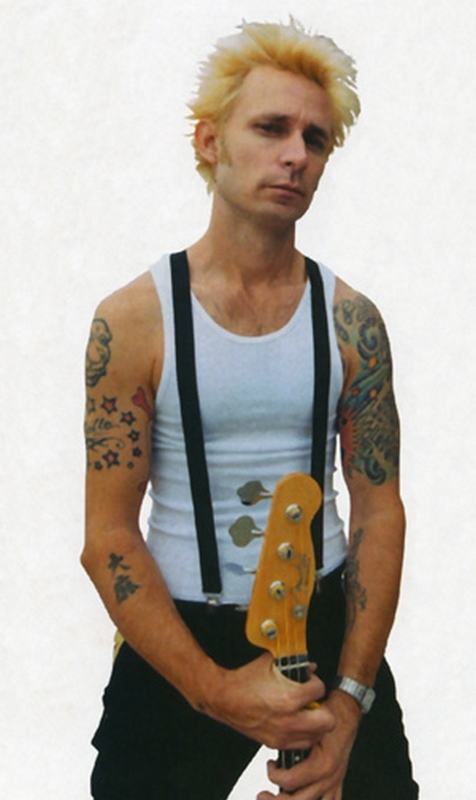 On the inside of his left arm, the Screeching Weasels symbol represents another of Mike's side bands. The band officially broke up on July 6th, 2001. The only tattoo Mike has in memory of someone is located on the inside of his left forearm. The tattoo, a dagger with a snake around it and the word "brother" inside, is a reproduction of a tattoo Jason Andrew Relva, a friend of the band, had. Jason died in a tragic/possibly suicidal car accident. Mike has a large tribal tattoo on his right ankle. It is rumored that he may have a tattoo of a tiger clawing at his chest. 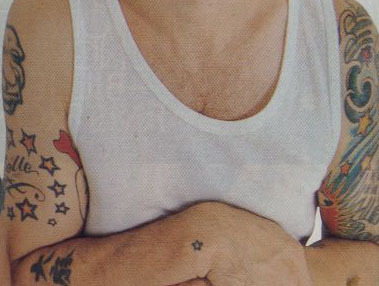 The smallest tattoo found on Mike's body is a black star on his right wrist similar to the ones found on Billie Joe's arm.